Well, this time last week I was in Devon, getting sunburnt, eating ice-cream and generally having a fantastic time. This week I'm dodging showers and trying to resist the temptation to put the heating on. Welcome to a British Summer! 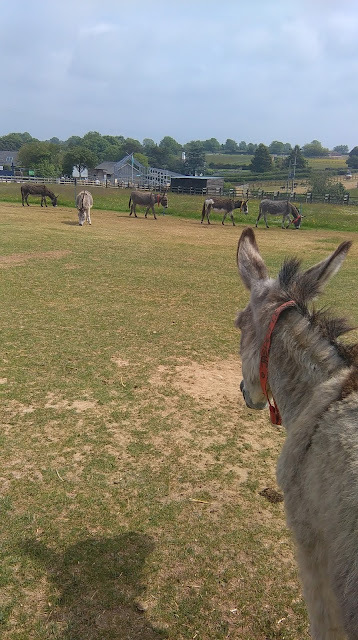 On one of our days, we headed off to the Donkey Sanctuary near Sidmouth. Now I have a real soft spot for donkeys, but really, what's not to love about a donkey?? The sanctuary in Devon is home to around 500 donkeys and is open 365 days a year. It's free to enter but there are plenty of opportunities to donate or you can even sponsor a donkey (I nearly did - I was very tempted). Now I didn't get my hopes up too much for any donkey interaction (does that sound weird?) The last thing I wanted was to go somewhere where animals were being stressed by being stroked or prodded by a load of visitors. I needn't have worried though. The donkeys were independent little things and there was so much space for them to roam and get away from inquisitive humans. And those donkeys that did want a head scratch or two could always find a willing human to oblige. I could have spent all day there happily just watching them all. I was impressed at the size of the fields and paddocks they were in which gave them plenty of space to roam and roll around. There was an inner courtyard where some of the friendlier donkeys were allowed to get up and close with visitors. Dogs that were on leads and well behaved were allowed in and it was lovely to see the look on some of the dogs faces as they came nose to nose with a donkey for probably the first time in their lives. But even in the courtyard, there were places for the donkeys to get some space and helpful staff who very patiently answered all my (probably obvious) questions! So that's my thoughts on the Donkey Sanctuary - I would definitely recommend it if you're in the area. You can spend as little or as long there as you like. They're currently doing some building work for what looks like a new cafe and entrance, but it didn't bother us and is a perfect excuse to go back again when it's finished.